Graeme Moffat is a Senior Fellow at the Munk School of Global Affairs and Public Policy, and the Chief Scientist and Vice President of Regulatory Affairs with Interaxon, a Toronto-based world leader in consumer neurotechnology. He was previously Chief Scientist with Meta (now Chan-Zuckerberg Meta), an AI-based discovery service for scientific information. Dr. Moffat served as Managing Editor of Frontiers in Neuroscience as it grew to become the largest open access journal series in the field of neuroscience. He undertook leadership roles in the publication of the first peer-reviewed data reports in open access publishing, as well as in the creation and launch of the award-winning Frontiers for Young Minds, a peer-reviewed journal of science and technology for elementary school children. 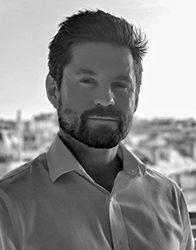 Dr. Moffat is an advisor to the neurotechnology policy initiative of the OECD and served as a member of the Conseil Scientifique of Université Aix-Marseille. His interest in innovation policy stems from his work as a research engineer in the cochlear implant industry in Sophia Antipolis, France, his experience in the Geneva-Lausanne technology cluster, and his ongoing work with the Canadian Council of Innovators. His most recent policy work was included in the Ontario 360 transition briefing series published by the Munk School. Dr. Moffat is a coach with ReachUp, an organization that aims to build confidence and encourage healthy lifestyles for indigenous youth through ultimate frisbee. He holds a PhD in neuroscience from Université Aix-Marseille and a BSc in physics from McMaster University.